2015 now called the Opera Plaza. The Opera House was officially opened on the 29th of February 1904, the first leap-year of the century. It was however completed in 1903, built by Messrs. B. and F. Wheeler. It was used for operas, plays and ballets as well as for films. In fact the first talkie produced Al Jolson's "Singing Fool" was shown there. Such famous players as Pavlova, Galli-Curci, Leonard Payne, Marda Vanne and many others appeared on its stage. There were rooms for the staff of touring companies to live in, in the theatre. There were however only two toilets for ladies, although several for men. The theatre had a seating capacity for 600. The gallery, known as the "gods" was licensed to seat 200 but often as many as 400 crowded in. 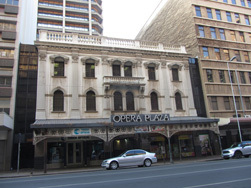 The facade of the Opera House is extant, there is now a shopping centre inside called the Opera Plaza.